President Trump went in front of the public on Saturday and claimed he was going to propose a “compromise” to end the ongoing government shutdown. Instead of offering a bipartisan bill that would protect Deferred Action for Childhood Arrivals (DACA) and Temporary Protected Status (TPS) recipients from deportation, the 1300-page bill unveiled Monday night was loaded with broad attacks on protections for children and asylum seekers. Calling these provisions “a poison pill,” Democratic leaders swiftly denounced the plan, indicating that the “compromise” bill was dead on arrival. In exchange for massive restrictions on asylum and the gutting of Temporary Protected Status (TPS) for future beneficiaries, the Trump administration is only offering short-term “fixes.” This includes a costly, difficult-to-obtain temporary reprieve for individuals with DACA and current TPS holders from El Salvador, Honduras, Nicaragua, and Haiti. This new status, “provisional protected presence,” would apply for three years and then expire. There is no path to citizenship. Aside from being temporary, the proposed status outlined in the bill would likely do little for those with DACA or TPS, as the administration’s attempts to end both of these protections have so far mostly failed. On Tuesday morning, the Supreme Court remained silent about whether they would take up a request to hear a case challenging the elimination of DACA. Even if the Court later decides to hear the case, arguments would not be until at least the fall of 2019. As a result, DACA beneficiaries will be able to renew their status through at least this year, which may reduce pressure on including DACA protections in a near-term budget compromise. Similarly, many TPS holders whose status was terminated by the administration remain protected due to court actions. The bill unveiled on Monday, called the BRIDGE Act (despite bearing little resemblance to a previous bipartisan bill bearing the same name), limits new protections only to those who currently have DACA, or those who have TPS from El Salvador, Honduras, Nicaragua, and Haiti. However, the bill imposes additional restrictions that would prevent many from being eligible for the new status, including some who are already DACA and TPS recipients. Among these restrictions are a series of financial burdens designed to make it hard for low-income recipients to qualify for the new status. In order to qualify, DACA and TPS recipients would have to satisfy a higher burden of proof for eligibility, prove that they would be able to maintain an income no less than 125 percent of the federal poverty guidelines, and in some cases would have to repay refundable tax credits that they had lawfully received. 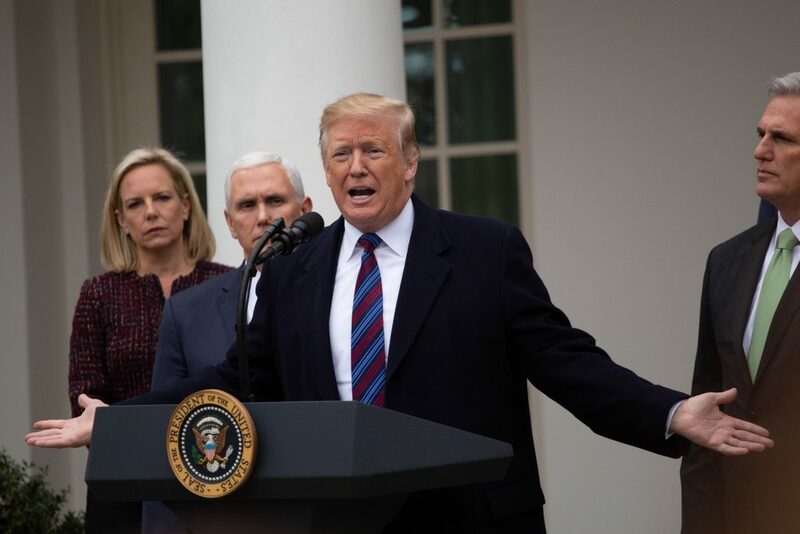 In exchange for this extremely limited and expensive new status, the bill includes the president’s demand for $5.7 billion for a border wall, along with an increase in ICE detention to 52,000 beds and money for additional Border Patrol and ICE agents. The bill also includes a series of poison pill amendments which strip asylum eligibility from children from Honduras, El Salvador, and Guatemala. Those children would be rendered ineligible for asylum unless they go through a new application process that requires them to apply in their home countries or in other Central American countries. Under this new process, only 50,000 applications would be accepted each year, and only 15,000 asylum grants would be permitted. Children would also have to prove they have a “qualified parent or guardian” in the United States to establish eligibility. In addition to these and other major restrictions on asylum for children, the bill proposes a series of changes to asylum applications in general. For example, asylum applications could be deemed “frivolous” if the applicant “in whole or in part” requests asylum in order to obtain work authorization, which many applicants need to do to support themselves while they await a decision. The bill also further limits humanitarian protections by gutting the future of TPS by limiting it only to individuals “lawfully present” in the United States when a disaster or conflict strikes their home country. This loses sight of the original purpose of TPS—to provide temporary safe haven to people in the United States based on a discreet need for protection, regardless of immigration status. Despite the president’s claim that this bill was a “compromise,” the devil was indeed in the details. It’s a laundry list of attacks on critical protections for children, asylum seekers, and those fleeing disasters. It is not a serious attempt at finding common ground. Given the bill’s chilly reception, any hopes that it would be the vehicle to end the shutdown seems highly unlikely.